Coach Yancy Culp's Fitness Program - Yancy Camp - Fitness for Everyone! 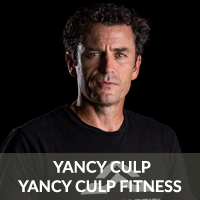 My name is Yancy Culp, and I have been coaching personal and large group fitness for 25 years. I’m wildly passionate about fitness, and I love being knee deep in a career where you can’t fake it. You must love fitness to be successful, and I absolutely love it! I’m confident you’re going to enjoy this program and the results. This program is designed for those who need healthy direction to get their fitness journey rolling. This program is setting you up for success. This is your program and I’m here to help make sure it works for you. In most cases, if you can walk and breathe, this program is for you. You may be nervous about beginning the journey toward improving your health and fitness and the commitment it’ll take. As a fitness coach for many years, I understand this, and it’s very normal. Together we’re going to make it happen. It’s time to say yes! 3 workouts + weekly bonus workouts will be launched each week. Every workout will be designed in a way that allows you to get your workout it in at home, the park, you gym, or while you are traveling. Every workout is designed to be quick, effective, and convenient. *3 workouts each week plus your bonus is a good week. We have to set this up where you will be successful and that is exactly what I have done. More to come on this subject! Once you’re signed up, you simply go to YancyCamp.com and select Member Login. Your weekly workouts, exercise videos, and fitness and wellness testing log are right there for you. There will be a mental conditioning blog post before every workout. I feel mental conditioning is as important as physical conditioning and I am confident you will enjoy this added bonus to your physical workout. This program will not overwhelm you. It’s designed to fit in to everyone’s busy schedule. This program is setting you up for success! After sign-up, we encourage you to complete your fitness and wellness tests and log your results in your online testing log (you have the ability to choose private or public for your testing entries). With your consistent approach to this program, you are going to see improvements and you’ll be able to easily track your progress. You will have access to our private Facebook group called – Yancy Culp Fitness. This is where we will discuss, workout questions, nutrition strategies, life challenges, give praise, and so much more. My wife Amy Culp is a Registered Dietitian and the Director of Sports Performance Nutrition for a major university, she will always be available to answer your nutrition questions. This program is the beginning of your new fitness journey. If at any point along the journey you begin to look to reach greater heights, Yancy Camp offers many online training options that will be a natural graduation step for you. This program is designed to provide you with a level of accountability to your team. It is widely known that joining a team will help you stay focused and committed. Once you sign up, you are making the commitment to complete your training and with this commitment, we are confident you will enjoy the results. Your membership is a month to month recurring charge, and you can cancel any time without question. I’m excited to begin this journey with YOU! Box squat & press (men 50lb & women 35lb) x 2 minutes for max repetitions *Use a box that allows your hip crease to get at or below your knee height. *Your hips, knees, and elbows should be at full extension as you complete each press. *If you’re unable to complete a rep for this challenge, mark 0 (zero = 0) as your score. Row 500 meters for time *A Concept 2 Rower is recommended. *Anytime you re-test make sure you use the same brand of rower you used during your initial test. 15% incline x 15min for max distance *Using a treadmill that will incline to 15%, cover as much distance as possible in 15min. *During the test you are not allowed to hold on to the front or side of the treadmill. *During the test you are not allowed to rest with your feet off to the side of the belt. *You can walk, run, or a combination of both. My name is Yancy Culp. I’m a husband, father, veteran, group fitness coach, personal training coach, Spartan SGX Obstacle Course Racing Coach, Power Systems Master’s Coach, an Alpha Warrior Pro Coach, motivational speaker, and business owner of several companies. For 20 years I’ve gained fitness coaching experience coaching large group fitness boot camps, middle school, high school, collegiate, and professional athletes, Soldiers, Airmen, Sailors, and Marines in the US Military, professional, competitive, and open category obstacle course racing athletes, and hundreds of personal training clients. For twelve years I owned a fitness business where I coached large group fitness boot camps with clients from all levels of fitness joining the same workouts. The vast majority of my clients stayed with my program for many years and learned how to make fitness a consistent part of their life. As your fitness coach, I have to be an artist and motivator who can create an effective training program that you’re going to enjoy and be consistent with. This is my job! You can’t fake a career in fitness. To be successful, you must absolutely love what you do, and as your coach, you have my word that I love and cherish physical and mental fitness. We’re on this journey together and it’s time to light up the planet.